We would like to thank you for the lovely stay and the wonderful hospitality. All the people who work in the Ryokan Shimizu were absolutely wonderful. As a family and as a couple we enjoyed the fabulous privet bath and we felt safe for our daughter in this most friendly environment. Thank you so much. I apologise that this e-mail is a bit delayed, but I would like to thank all your staff for giving us such a wonderful stay. The room and facilities were excellent, as was the location. Everyone was extremely friendly, and the extra little touches such as bringing tea and water to the room were wonderful! 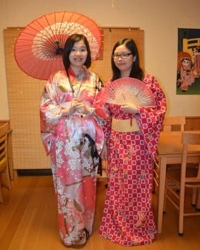 We had a lovely time, and will definitely be returning again when we next visit Kyoto. We will also be recommending this Ryokan to others as we were so impressed by it! Please thank all the staff on our behalf for their kindness. We hope to see you again soon! Arigato Gozaimashita! Thank you for a great stay! The inn is beautiful, the staff is very pleasant, and breakfast was delicious. I enjoyed it very much! My mother and I stayed in the Shimuzu Ryokan last week for three days. We had such a nice time in Kyoto. Thank you all for the comfortable accomodation and your kindest service. Thank you all again. This was our second stay at the Ryokan Shimizu and we were not disappointed. It is a short walk from the railway station, it is fresh and clean and the staff are friendly and helpful. Even with your own bathroom it is worthwhile reserving the public bath, it is a great way of relieving tire limbs at the end of a long day's sightseeing. An easy introduction to the Ryokan experience. 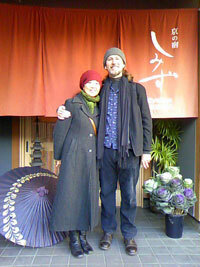 We look forward to returning next time we are in Kyoto. We spend 11 nights in the Shimizu Ryokan and it was just pleasure!! The staff is really lovely and helpful. Also it's a great location: just 5 minutes walk from the Kyoto station so you can take all the buses you want or travel out of Kyoto with the train and just don't have to stress about the time you need to go to the station. For sure if we go to Kyoto again it will be SHMIZU RYOKAN And just want to thanks all the staff : DOMO ARIGATO GOZAIMASU, and hope DEWA MATA!!! 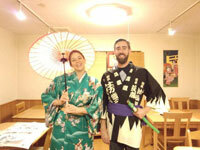 We returned from Japan last Wednesday and found the Ryokan Shimizu staff and accommodation to our satisfaction. The staff were helpful and had enough English to be able to assist us when we asked them a question. Although small it was clean and well situated. We enjoyed the bath house experience too. 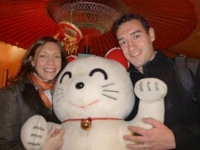 All together it helped us to have a very pleasant experience in Kyoto and we would stay there again. 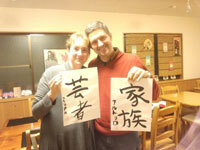 We returned Sunday from three weeks in Japan. Everything went according to plan and all the reservations worked out well. We had no complaints with any of the hotels booked. In fact the Ryokan Shimizu in Kyoto was a pleasant surprise and even the business hotel in Gifu was fine. Nagase in Takayama was quite a special place and to make it even more so, there was a one time only festival going on in town. Thank you for your assistance in making this happen for us at short notice. The best place we stayed during 2 weeks in Japan. Ideal for first time Ryokan visitors. Incredible value and wonderful staff. We only wish we could have stayed longer.